5 Homemade snacks that will keep your Toddlers hunger at bay. If there’s one thing that I wasn’t really prepared for as I stumbled through the first couple of years of parenthood, it would be discovering the sheer amount of snacks that Toddler Triplets can consume. We always try to have lots of fresh fruit available for snacks, but I’ve noticed recently that the trio have been asking more and more for the packaged junk food that is intended to be only for a special treat. What’s the best way to avoid a meltdown when Mum says “no” to packaged junk food? Have a list of tasty home made snack foods on hand! 1: Banana and Sultana Muffins. We make these so often that the kids could probably make them without me now……on second thoughts, I might not have a kitchen at the end so I don’t think I’ll be testing that theory yet!! 2: Apple, Sultana and Cinnamon wraps. These 3 ingredients were meant to go together, and what could be easier that rolling them up in a wrap and toasting it? Note: Some grown-ups will probably want to add some sugar, but the kids really don’t need it. 3: Make your own Pizza toast. My kids love Pizza and this easy to make snack is close enough to keep them all happy – They can even make it themselves Click here to see how that went. 4: Mango and Peach Loaf. This loaf is ideal for slicing into individual portions, wrapping up and freezing. However, in our house the whole loaf is usually gone before I get chance to freeze any. Do you have a Toddler who doesn’t like to eat the crusts on their sandwiches? Why not cut them off and use them to make a tasty snack that they will love. If you decide to try one of these recipe’s I’d love to hear about it! Pictures would be even better!!! Thank you for the recipes. I love the idea of using up the leftover crusts; we have so many at the end of the day and they normally get fed to the chooks. I’ll be keeping some back to make cheesy breadsticks – yum! Thanks Rachel, I hope you enjoy them, my three have started giving me their crusts as soon as they finish their sandwiches and asking me to bake them now! I think the Cheesy breadsticks would be great to use instead of soldiers with some fresh laid soft boiled eggs from those Chooks! Hello, back again! You’ve made featured pinner.Please come to my blog to collect your badge to display on your blog. Oh these all look yummy! 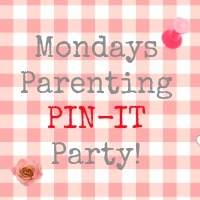 Thanks for taking part in the Parenting Pin-It Party.Don’t forget to join again tomorrow over on my blog. I hope your family enjoy these tasty snacks as much as mine do!